A general strike successfully defeated the ruling military Junta and temporarily halted a campaign of discrimination against the countries southern population. This event is known as the October Revolution. By October of 1964, an issue called the “Southern Problem” had formed in Sudan. This Southern Problem was essentially a dispute between the Arabized Muslim North and Christian South of Sudan. The northern “Sudanization” of southern administrative positions and ethnic, cultural, and religious differences began to manifest in discrimination against southern Sudanese, planting the seeds for this problem. The Southern Problem grew with the rapid Arabization of Southern Sudan, in which Arabic replaced English as the language used in schools, and Christian missionaries were forbidden from founding new schools or practicing their religion outside of their churches. Ibrahim Abbud, the first president of Sudan, led a military government for six years in which his military regime voiced confusion over the Southern Problem, and thus permitted public discussion of the problem at Khartoum University. On 21 October, the University Students’ Union held a meeting to discuss the Southern Problem. The students expressed hostility against the regime and concluded that the problem would never be resolved so long as the military regime continued to hold power. The government of Sudan responded by banning all further meetings and discussions on the Southern Issue and establishing a curfew. However, the Anti-Imperialist Front and the University Students’ Union defied the ban, stayed out past the curfew imposed, and held another meeting on Khartoum University campus. The police arrived and attempted to disperse the meeting, throwing tear gas and opening fire. Several students were wounded and one student, Ahmad al-Qurashi, was killed. On 22 October, a mass demonstration took form in a funeral for Ahmad al-Qurashi. Over 30,000 marchers were present, led by university faculty, chanting anti-government slogans. The Sudanese university staff also tendered their resignations, which they would only reverse if the military regime ended and a constitutional government was established that would protect the university’s independence. On 23 October, the Umma Party in Sudan released a statement denouncing the regime’s economic policy and the country’s rising cost of living, and demanding a democratic constitution. Student demonstrations continued and spread to other towns, including Omdurman, Juba, and Port Sudan on 24 October. Also on 24 October, a group of professionals led by lawyers attempted to present a petition against government brutalities to Abbud, but the professionals were not allowed to proceed. Before the people dispersed, they declared a general strike. The general strike was so effective that the government machinery, general communications, and shops were shut down. On 25 October, the National Front of Professionals – including university staff, teachers, judges, lawyers, engineers, and doctors – and the National Front of Political Parties – including the Umma Party, the N.U.P, the Communist Party, and the Muslim Brothers – joined the leadership of the campaign, forming one organization: the United Front. The National Front of Professionals then declared a general political strike, continuing from the original strike call, to start on the following day, 26 October. The military officers and troops by this time had become split on the campaign. Junior officers were sympathetic to the demonstrators while the senior officers advocated the use of violence to suppress the campaign. The Sudanese launched a demonstration in front of the presidential palace and the building in which the Supreme Council of the Armed Forces was meeting. Junior military officers took part in the political strike and demonstration, forming a protective ring around the demonstrators and refusing to shoot any citizens. Abbud attempted to appease the people by declaring the dissolution of the Supreme Council of the Armed Forces and the Council of Ministers. The Sudanese rejoiced with this first victory. On 27 October, negotiations began between the United National Front and representatives of the armed forces. Abbud stated that a transitional government would be formed pending the adoption of a new constitution, and the United National Front agreed to form the transitional government under Abbud. However, Abbud then declared his intention of assembling the Central Council and forming a new Supreme Council of the Armed Forces at a press conference. This declaration led the United Front to call for the demonstrations and strikes to continue. On 28 October, the staff at Radio Omdurman went on strike. The military then took over the radio station and announced that it would use force to disperse demonstrators, but this did not quell the demonstrations. The negotiations finally came to a close on 29 October. The United National Front, with the agreement of representatives from the army, drew up a National Charter, which included the original demands that the United National Front had. On 30 October, the campaign and strikes ended with the establishment of the transitional government. Abbud still remained the head of state, but resigned due to pressure on 15 November. The transitional government gave women universal suffrage, established a committee with the purpose of purging corrupt officials from civil and military positions, lifted the state of emergency, reinstated freedom of the press, and repealed the restriction of certain fundamental rights in the penal code. The transitional government also addressed the Southern Problem by granting amnesty to all Southerners that had carried arms, released political detainees in the South, and planned to hold a conference on 18 February 1965 to solve the problem. Collins, Robert O. A History of Modern Sudan. Cambridge, UK: Cambridge UP, 2008. Print. Hasan, Yusuf Fadl. 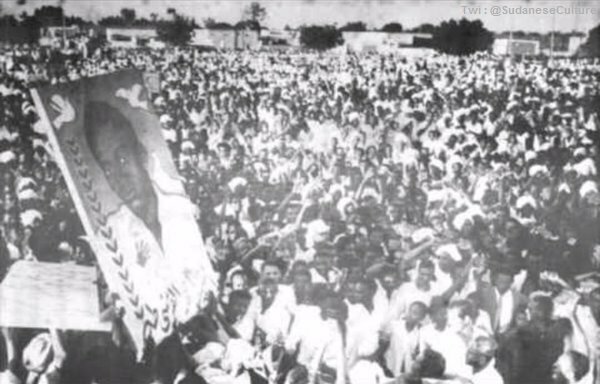 "The Sudanese Revolution of October 1964. The Journal of Modern African Studies. 5.4 (Dec., 1967): 491-509. JSTOR. Web. 4 Nov. 2012. .
Holt, Peter Malcolm., and M. W. Daly. "Parliamentary and Military Government: 1956-69." A History of the Sudan: From the Coming of Islam to the Present Day. 6th ed. Harlow, England: Longman, 2011. 122-23. Print. Holt, Peter Malcolm., and M. W. Daly. "The Transitional Government and the Second Parliamentary Regime: 1964-9." A History of the Sudan: From the Coming of Islam to the Present Day. 4th ed. Harlow, England: Longman, 1988. 181-88. Print. O'Ballance, Edgar. "The Rejected South." Sudan, Civil War and Terrorism: 1956-99. Basingstoke [u.a. : Macmillan [u.a., 2000. 22-24. Print. Sidahmed, Abdel Salam. "Generals, Militants and Politicians." Politics and Islam in Contemporary Sudan. New York: St. Martin's, 1996. 75-78. Print.